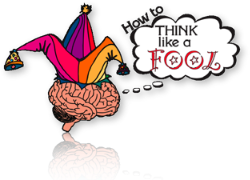 There's no guarantee that thinking like a fool will be helpful at all in creative problem solving. There are so many things outside your control or working against you, that it boggles the mind when inspiration occasionally appears. But what else are you going to do? Stop in a self-imposed paralysis? Give up because everything you've tried has failed? Don't even try, because things may not work? "Chance favors those in motion." Film comedian Harry Langdon's stage and screen character was a master of trusting in dumb luck, innocently diving into risky actions and often succeeding in spite of his misguided efforts. In his short film Luck o' the Foolish, Harry is shaving on a train using a straight razor with such nonchalance and disregard for the instrument's shapness that one is sure he will cut off his ear. He even uses the blade to clean shaving cream from the inside of his ear (do not try this at home or on a train). It's this attitude of trust in action without over-thinking, over-worrying, and second-guessing, that sometimes will allow random events to contribute more to a solution than you ever could. Don't try to drive the roller-coaster—sit back and enjoy the ride. Think: Why not trust in dumb luck for awhile? Why not enjoy giving up some of the control that I might be imagining anyway? If you are going to wish for anything, wish for good luck! Then be prepared to act on it.